Cut a long slit down the middle of the eggplants, being careful not to cut them too deep to the bottom. Sprinkle some salt inside of each eggplant and let it sit for 30 minutes to get rid of the bitterness, then rinse out the salt. Another option is to cut the eggplants down the middle, place them in a large pot with salted, boiling water, and blanch them for 5-10 minutes until they are tender, but not too soft. Afterward, move the blanched eggplants onto a plate, place something on top of them (such as a plate) to squeeze the water out of them, and let them cool. Cook the stuffing in a large pot or skillet over medium heat. Stir continuously until it is well done. After the meat is done cooking, add salt, pepper, chopped herbs and 1 skinless chopped tomato, and mix well. Add butter or oil if needed. Remove the stuffing from the heat and let it cool. Carefully open the slit on the eggplants and fill them with the stuffing. Place the eggplants side by side in a deep baking pan, stuffing side up and place 1 skinless finely chopped tomato around the eggplants. Preheat the oven to 350°F (180°С). 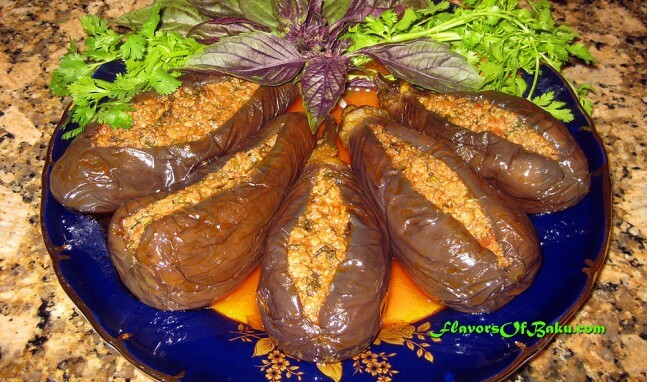 Cover the baking pan with foil, and bake the dolma until all the eggplants are tender and cooked. Or you can cook Badimjan Dolmasi in a saucepan. Place the eggplants side by side in the saucepan, stuffing side up and place the finely chopped tomato around them. Cover the pan with the lid, and cook over a low heat until the eggplants are tender. Watch your eggplants, do not let them overcook and become mushy. Add some hot water or beef stock if needed. Serve Badimjan Dolmasi with a mixture of plain yogurt and crushed garlic.